For guests looking for total seclusion, choose our Roost in the Barn. Enjoy all the amenities of the bed and breakfast including the hot tub, wrap-around porch, parlor and dining room but with a space all your own. The renovated horse barn is about a hundred yards down the hill from the main house with its own private driveway. Rustic details complement modern comforts in this extra large room with sitting area. The King size bed sits high on a fencepost bed frame and is decked out in denim. The private bath features a custom shower with exposed plumbing, rain shower head and pebble tile floor. 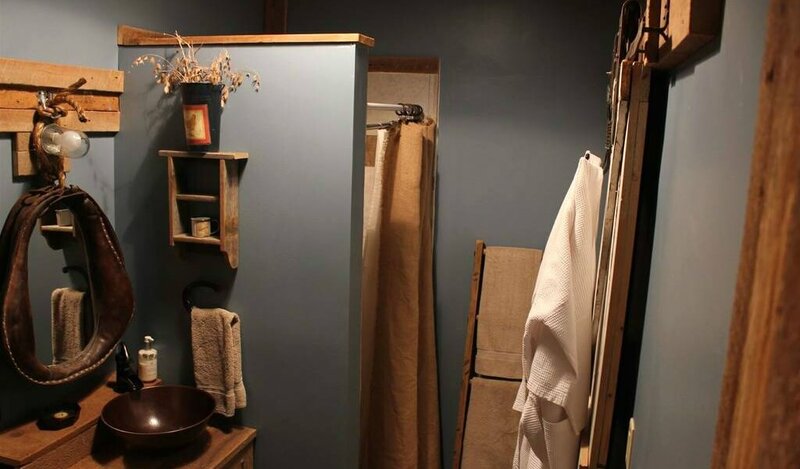 The sliding barn door, garden tool curtain rods, a vanity made from barn wood and the horse collar mirror showcase just a few of the upcycled materials we used to create this retreat. The bright yellow walls contrast the rustic barn motif and you’ll enjoy an extra large room with sitting area. The double recliner provides a nice spot to kick up your feet and relax. The mini-fridge has bottled water and room for your own favorite snacks and beverages. An additional double-sized bed makes this room a favorite for girlfriend getaways, sleeping up to 4 comfortably. The Roost in the Barn is one of our two pet friendly rooms, with its size and immediate yard access favored by our larger, furry guests. WiFi is available. The TV provides basic digital over the air channels with the option of selecting from our movie library with DVD player. The Barn is fully equipped with heating and air conditioning for year-round comfort. It’s been a ton of fun decorating this old barn room and we hope you’ll enjoy the rustic setting, modern conveniences all within this unique atmosphere. Rates vary seasonally and include a full gourmet breakfast for 2. Each additional guest: $15. Pet Fee: $15. Select your dates and number of guests to see rates. Room can sleep up to 4.